Before western “civilization” industrialized the transportation of water to our normally-arid region, indigenous peoples in these dry lands lived where nature chose to hydrate the landscape. In one very special case, the terrain was shaped by ocean sedimentation, upheaval, and erosion to form an almost inaccessible canyon-channel with sufficient elevation change to form magical waterfalls and pools connected by a linear oasis of flowing, crystal-clear, blue-green water. It is known as Havasu Creek (not to be confused with the similarly-named Lake Havasu many miles farther down the Colorado River). 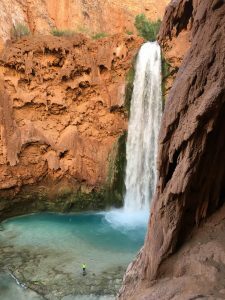 Inhabited for hundreds of years by the native American Havasupai (literally “blue-green water people”) , the village of Supai lies just a couple of miles downstream from Havasu Spring. The spring is fed by an aquifer beneath the Kaibab Plateau and supplemented by direct rainwater runoff and snowmelt. It is the calcium carbonate (aka “lime,” from limestone) in the water that enhances the turquoise-colored reflections from its surface. The limestone is among the sedimentary components of the plateau, through which the groundwater percolates, and through which the surface water flows and cuts on its way to join the Colorado River at the bottom of Grand Canyon. With no other surface transportation to Supai aside from horseback, most visitors hike a challenging decent from the Hualapai Hilltop trailhead, at the end of a 60-mile road north of US Route 66. As the trail descends in altitude, it also takes the traveler back in time, layer-by-geographic-layer, which were uplifted starting about 65 million years ago. The “top” layer was once the “bottom” of an ancient ocean. Now it is 230 million year-old solid rock known as Kaibab Limestone. From the Kaibab layer downward, the walls of Hundred Fifty Mile Canyon reveal various strata of sandstone, limestone, and volcanic ejecta, on the way down toward the 2 billion year-old igneous and metamorphic layers in the deepest parts of Grand Canyon. Departing the switchbacks of the canyon walls, the intrepid visitor is left hiking along the dry, dusty stream bed at the bottom. Thankfully, a few million years of erosion has left a multitude of ledges for shady rest stops along the stream bed. Hundred Fifty Mile Canyon joins Havasu Canyon just below Havasu Spring. It is at this confluence that you can first splash your face with 70-degree water. Much of the remaining hike into Supai is in the shade of trees watered by Havasu Creek, as well as a small man-made channel that diverts a portion of the flow along a higher route to supply the village. As the tree canopy opens, the visitor is greeted by the Wigleeva, a pair of massive balanced rocks on the ridge above. The Wigleeva keep watch over Supai. Havasupai tradition says that if the Wigleeva should fall, the canyon walls will close back together. Refreshments and meals are available at the convenience store and restaurant. You can stay in the lodge, or continue your hike on to the campground that stretches along the creek. For me, the hike in to Supai was enough for the first day. The second day was devoted to a little downstream exploring. Navajo Falls provided easy-access pools for soaking and splashing. The cool water soothed sore muscles. Farther down, Havasu Falls has carved out a larger pool, and generates a chilling spray carried by its own wind. Mooney Falls is the tallest and most spectacular. However, getting down to its pool was challenging enough that I only made it halfway. After two tunnels carved through the canyon wall, I stopped at a great vantage point right above what looked to be a challenging final descent. Mooney Falls, see human at bottom for scale! Rods driven into the canyon wall and connected by heavy chains called for nerves of steel and orthopedic stamina. However, other visitors having obvious failings in both areas, passed me and continued their descent to the bottom. I was content with contemplating and photographing from the higher vantage point! More wonders lay downstream, but the descent at Mooney Falls and contemplating the hike out of Supai the next day were enough to deter me. The trip to Havasu Creek was the most physically challenging exploration I’ve undertaken in a long time. But it’s also now one of my Arizona favorites, along with Canyon de Chelley and Monument Valley. I wish we’d had at least a couple more days to explore and enjoy. The Havasupai we encountered along the trail and in the village were mostly quiet. I wish we’d had more time and more opportunity to speak with some of them, to get to know their perspectives and their knowledge. But I appreciate them sharing their land, their waters, and their wonders. Be careful. There are no public health facilities available, and it will take a long time (as well as probably a helicopter ride) to get serious injuries treated. It can be very hot in the summer. Plan ahead and make reservations for September through April, if possible. Obviously there’s more foot traffic (and mule trains) on the trail during the cooler months, but you have to balance solitude against comfort. Professional tour guides are available from a handful of companies. They can even arrange to pack-in food, and cook meals for you. 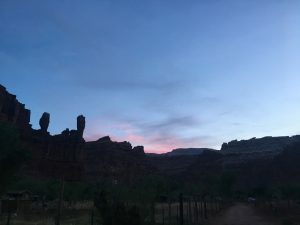 Since you are investing a half-day’s drive to the trailhead, a half-day each on the hike in and out (both of which require a full day’s worth of energy), and a half-day’s drive home, you really should plan for more than a day to explore at the bottom. I’ll plan for at least three days next time, with at least a day in historic Seligman (to visit Westside Lilo’s Restaurant and the historic Snow Cap Drive-In for ice cream) before and/or after all the hiking. Trailhead parking is crazy. We arrived around 8 am, and had to park a half-mile away on the edge of the road. I’d even consider arriving later in the day to get a closer parking space, and car camping for a daybreak departure down the trail. Physical stamina is VERY helpful. 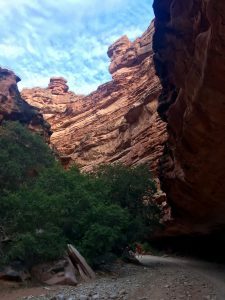 If your only experience is a few hikes on local trails, or the Bright Angel Trail at Grand Canyon, you’ll be in for a little bit of a surprise. Plenty of water is a must, minimum 2.5 liters per person. There is NO WATER available (other than at the mercy of fellow travelers) between the trailhead and the creek. Most sources recommend against drinking the creek water without filtering it first. Pack weight is not your friend. Plan your food for the trail. Grocery items and some microwave items are reasonable in the convenience store, and meals are a little more expensive (but good) in the restaurant. However, hours of operation can be limited and inconsistent, as they are dependent upon deliveries via mule train or by helicopter. Uneven surfaces such as river rock, gravel, sand, and powdery decomposed limestone make good footwear and hiking poles a strong recommendation. I saw a few hiking shoes, and some of the experienced guides even wore Teva-style sandals. But I wouldn’t recommend either. The sky can be unrelentingly clear, so a wide-brim, semi-floppy hat is your friend. Back off the pace and enjoy your surroundings, even on the way into and out of the canyon. Millions of years’ worth of work went into building it for you! Saying “goodbye” to the Wigleeva as we hit the trail at 5 a.m. for the hike back to “civilization” before the heat of the day. 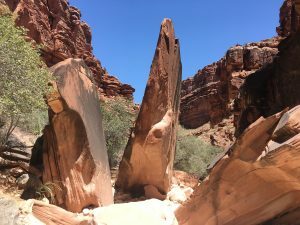 Education: We hiked in on Friday, right past the Havasupai Elementary School… which was padlocked and remained so all day. In light of the recent turmoil regarding short-funding of public education, inadequate teacher pay, and neglect of public school facilities by the Arizona State government, I was curious as to why the Havasupai school appeared to be closed. As I suspected, it’s not a state public school, rather it is administered (currently) by the Bureau of Indian Education or (in the past) by the tribe. 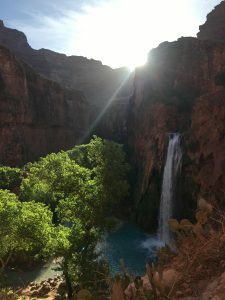 This article by Alden Woods at the Arizona Republic outlines the educational challenges facing the Havasupai, and how the federal government has so miserably failed these people. Emma Brown’s article in the Washington Post last year, gives additional details. 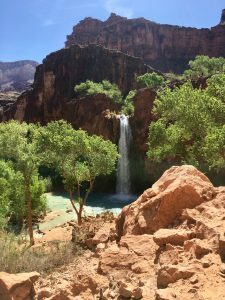 Environmental Issues: Like their Navajo neighbors to the east, the Havasupai are confronted with the specter of uranium mining. The detrimental effects of uranium mining upon the Navajo people stretch back to the World War II era. While most of the impact has directly affected Navajos employed as miners, concerns about leftover mine tailings and runoff are a more general threat to the Navajo people. 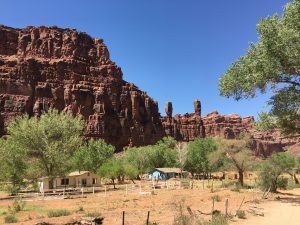 A new effort by Energy Fuels at their “Canyon Mine” has caused the Havasupai great concern for the aquifer that sustains the village and its tourism. The mine is 45 miles east of Supai, and six miles south of Grand Canyon. Despite assurances from Energy Fuels that there is no danger, the mine’s vertical drill shaft unexpectedly filled with water in 2016 (or, depending on to whom you are speaking, 2017). 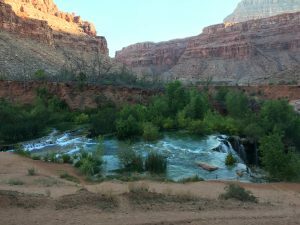 Some Havasupai believe the drilling penetrated the aquifer. Regardless, the water now being pumped out of the shaft is contaminated with uranium. So it is stored in a holding pond and/or trucked away by the company. If the water is from the aquifer, and layers that normally separate uranium deposits from the aquifer have been breached, no one knows the direction or speed of flow in the aquifer. For more information, please read Antonia Noori Farzan’s 2017 article in the Phoenix New Times, and the 2017 article written by Joanna Walters in The Guardian. And the Grand Canyon Trust website has more information, as well as the video below.